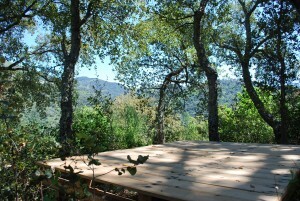 Welcome to Cloud House Farm, a secluded mountain yurt hideaway located deep in the hills of the Andalucian Rio Genal Valley just 1hr from Ronda. Close to the white washed village of Genalguacil and set against the spectacular backdrop of the Sierra Bermeja Mountain range. 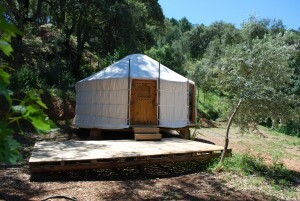 Perfectly located for adventure and discovery amongst Andalucia’s most spectacular hiking routes, Cloud House Farm offers a unique yurt holiday experience way off the beaten track. 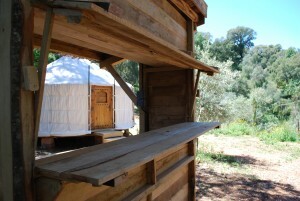 Set within 17 acres of mountainous cork oak forest, our handcrafted Mongolian Yurt offers an intimate haven amongst the trees. Visit BOOKINGS for more information. Cloud House Farm Yurt Holidays now listed with Responsible Travel “travel like a local”. 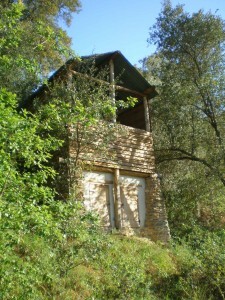 Set within 17 acres of a mountainous forest of cork oak, chestnut & olive the farm provides ample renewable wood fuel to fire the wood burning range in the farm house. The range in turn heats the house, allows food to be cooked & also heats the water. We have tried to minimize our non renewable carbon foot print and only rely on gas as a backup. The Farm in 100% off grid, an array of PV solar panels provide power to run all our electrical equipment. 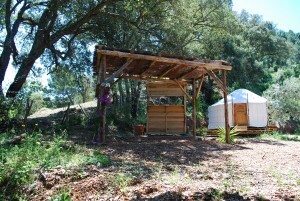 The yurt is also tied into this system. Fresh water is gravity fed from the farms natural spring while storage tanks and rainwater harvesters help sustain the gardens throughout the summer. Wastewater is processed through a twin chamber septic tank and filtered through a gravel soak away. All grey water is recycled to feed plants, while our guests can enjoy using our outdoor eco loo, a compost toilet boasting spectacular views of the mountains across the valley. We are currently applying for Organic status, our vegetable garden is only fertilized by using our neighbours goat manure (rocket fuel! ), and we will not allow the use of any non natural cleaning product as it drains directly onto the Farm. All organic food waste is composted for use in the garden. Chicken manure is also utilized. Half of the farm (some 10 acres) is left wild to encourage wildlife, offering a home to Iberian wild boar, deer, foxes, wild cats, kestrels, wood peckers, bea eaters & golden orioles to name but a few. We encourage people to arrive by train from either Ronda or Cortez de la Frontera. Its possible to get a bus from Ronda to our local village Genalguacil or Benarraba from where we can arrange a pick up. Its possible to walk or ride to the farm once in the valley.